Trova e identifica facilmente le stelle in tempo reale! Hai mai guardato il cielo e ti sei chiesto qual è quella stella che brilla così tanto di notte? 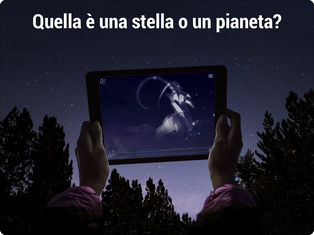 Con Star Walk 2 tutto quello che devi fare è puntare il telefono verso il cielo e migliaia di stelle, satelliti e comete saranno a portata di mano. ● Based on your feedback, we’ve added translations of our Astronomical news. ● New for iOS 12: use Siri Shortcuts to see what’s up in your sky quicker than ever. Create shortcuts and get a list of astronomical events for your location at any time without opening the app. ● Check out our new “Visible Tonight” section and be aware of the most interesting space sightings visible in your sky. ● Full support for the newest Apple devices. ● Minor bug fixes and performance improvements, of course. Don’t hesitate to reach us at support@vitotechnology.com with any questions, comments, or suggestions. As always, your ratings and reviews on the App Store are very welcome. Make the most of your stargazing experience with Star Walk 2!